Remember when taking notes meant simply putting pen to paper? Today the basic concept of putting pen to paper is the same, but the pen is digital. Here are two digital pens, the Livescribe Pulse Smartpen and Hantech Siso Tablo, that can make life a little easier this school year. The 1.3-ounce Livescribe Pulse Smartpen works like an ordinary ink pen—enabling you to take written notes on notebook paper. The pen takes on extra capabilities, though, when used with Livescribe paper (100 sheets included and you can print your own). The paper is loaded with tiny dots that the pen uses as reference points for its infrared sensors to capture your handwriting. As you take notes in class, the 2GB pen can also record the lecture (up to 200 hours). Your notes and the audio recording are linked, so you can tap on a word or drawing to hear the audio clip that was recorded at the same time. That means you can write a key word or two for every point your professor makes and the pen takes care of the rest. All the controls for the audio recording, like playback speed or adding bookmarks, are found at the bottom of each notebook page. There’s even a calculator tool printed on the inside cover, letting you tap the numbers and see the answers on the pen’s tiny display. When you dock the pen later, you can download and save your notes on your computer. The Livescribe desktop application will let you organize your notes, serarch for key words and play back the related audio. 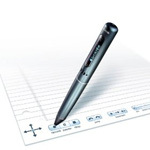 Another option for digital note taking is Hantech’s Siso Tablo. It simply turns any laptop into a tablet PC, letting you write or draw directly onto the screen with the stylus (which can also be used as a mouse). Switch to a pen tip (included in the box) and clip the sensor onto any regular notepad or piece of paper to capture handwritten notes or diagrams. The Tablo works with Microsoft Office and a handful of other programs.